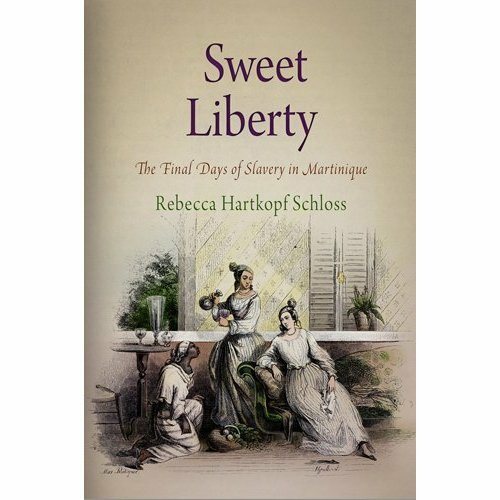 Rebecca Hartkopf Schloss, Sweet Liberty: the Final Days of Slavery in Martinique (Philadelphia: University of Pennsylvania Press, 2009). From its founding, Martinique played an integral role in France’s Atlantic empire. Established in the mid-seventeenth century as a colonial outpost against Spanish and English dominance in the Caribbean, the island was transformed by the increase in European demand for sugar, coffee, and indigo. Like other colonial subjects, Martinicans met the labor needs of cash-crop cultivation by establishing plantations worked by enslaved Africans and by adopting the rigidly hierarchical social structure that accompanied chattel slavery. After Haiti gained its independence in 1804, Martinique’s economic importance to the French empire increased. At the same time, questions arose, both in France and on the island, about the long-term viability of the plantation system, including debates about the ways colonists—especially enslaved Africans and free mixed-race individuals—fit into the French nation. Sweet Liberty chronicles the history of Martinique from France’s reacquisition of the island from the British in 1802 to the abolition of slavery in 1848. Focusing on the relationship between the island’s widely diverse society and the various waves of French and British colonial administrations, Rebecca Hartkopf Schloss provides a compelling account of Martinique’s social, political, and cultural dynamics during the final years of slavery in the French empire. Schloss explores how various groups—Creole and metropolitan elites, petits blancs, gens de couleur, and enslaved Africans—interacted with one another in a constantly shifting political environment and traces how these interactions influenced the colony’s debates around identity, citizenship, and the boundaries of the French nation.